USD held its first ever Drum Flow Retreat, which attracted high school students to the university last Saturday. For four hours, participants worked on snare drum techniques that improved their drumming abilities. While the retreat was open to adults, college and high school students, the majority of the attendants were the latter. This surprised the director of the workshop, Dr. Darin Wadley, the director of percussion studies at USD. “I expected zero high school students to come, and the fact that we had 15 was just amazing,” Wadley said. Out of the 25 participants, 15 were from high schools from around the area. 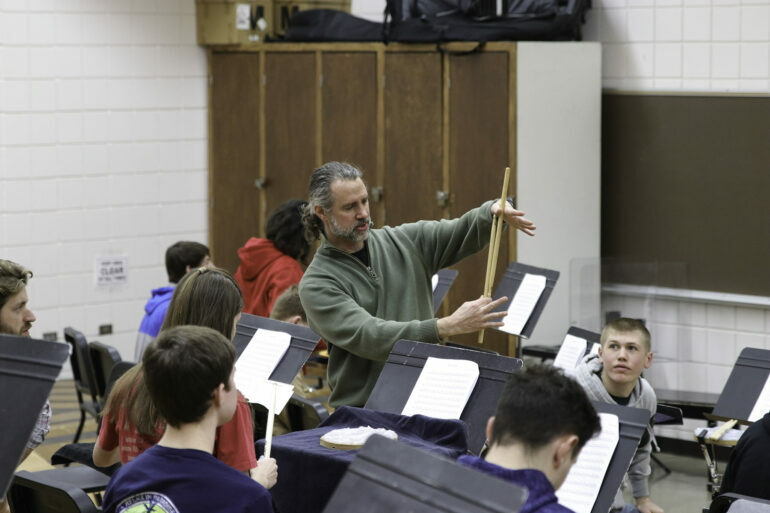 Wadley said that this workshop can be used to recruit more students into the music program and he believes making the cost of the retreat free helped bring in students. Although the majority were high school students, the retreat also benefitted English doctorate student, Simon Ferrell. He said the best thing about the retreat was focusing on basic technique for four hours. Wadley said most drummers don’t get a lot of time to focus on that technique. “I wanted an opportunity to really go in-depth on some fundamental snare drum technique that we usually don’t get a chance to do because we are so busy rushing around on music, so this is all just technique and how to drum,” Wadley said. With the high number of attendees, Wadley is looking forward to making the USD Drum Flow Retreat a reoccurring event. “This is the most successful event I’ve ever had here, so I’m really enthused by it,” Wadley said.